Every community has a canon that best encapsulates the genealogy of personalities, ideas, and events that shape the way the community sees itself and is perceived by others. The naval community is no exception. This article suggests that an important monograph has been overlooked in that canon: Fernando de Oliveira’s “The Art of War at Sea” published in 1555. It is the oldest treatise on maritime strategy. Maritime strategy and war at sea have long occupied the minds of sailors and statesmen. The scholarly study of maritime strategy, however, is a relatively recent endeavour. Its roots in the modern western tradition are found in the United Kingdom during the latter half of the 1800s. Authors such as the Colomb brothers, Sir John Laughton, and, more famously, Sir Julian Corbett were among the first to muster a robust understanding of strategy in discussions of naval problems. The United States soon followed suit as Alfred Mahan, William Sims, and Willis Abbot, among others, penned numerous other works to an increasingly sophisticated naval lore. Not surprisingly, the standard account of the disciplinary evolution of maritime strategy and naval affairs reflects this Anglo-Saxon outlook. This account is taught in naval academies and some civilian universities around the world, further reinforcing the existing canon. Other influences surely contribute to the debate, including Jomini and Beaufre, and even ancient Greeks, such as Thucydides and Themistocles, but by and large the naval lore is founded on works dealing with the British and American experiences at sea. In its rise to become the first global maritime empire, Portugal had to develop an understanding of maritime strategy that enabled the achievement of its political aims. Like Britain’s Corbett and America’s Mahan, Portugal’s greatest maritime strategist was Fernando de Oliveira. Writing at the peak of Portuguese power, Oliveira put in writing the foundations of that global empire. 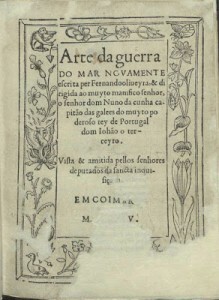 Fernando de Oliveira’s “The Art of War at Sea” (Arte da Guerra do Mar), published in Coimbra in 1555, stands as the oldest treatise on maritime strategy. Oliveira himself acknowledges that very little had been written on the subject; he only refers to Vegetius (4th century AD) for his important but sparse insights into naval warfare. In historical context, Oliveira wrote this treatise three centuries before Corbett, Mahan, and others acquired the habit of thinking strategically about naval warfare. So what can we find in Oliveira’s “The Art of War at Sea”? Frontispiece of the original “Arte da Guerra do Mar” (1555), by Fernando de Oliveira. The book is divided into two parts, the first dealing with the principles of war at sea whereas the second explores its conduct. Each part has fifteen chapters. The genius of Oliveira’s work is found not merely in his (dated) analysis of Portugal’s 16th century navy, but, more importantly, in his comprehensive grasp of the (perennial) foundations of maritime power. The chapters focus on topics such as just war theory, strategic theory, leadership, shipbuilding, logistics, personnel recruitment and retention, and military readiness. And this is just in the first half. The second part goes on to tackle force structure, situational awareness, oceanography, and intelligence, among other topics. These are obviously modern terms to describe very old phenomena. However, the challenges of 16th century naval power are not dissimilar to those of today’s navies whose countries depend on the sea for wealth and prestige. Oliveira, like Corbett and Mahan, was aware of this and expressed it in the opening pages of the treatise. Discussing naval matters, the author argues, “is a useful and necessary matter, particularly for the people of this land [Portugal] who now fare more at sea than others, whereby they gain many profits and honour, and also run the risk of losing it all, if they do not preserve it […].” This verdict ought to resonate contemporary strategists from nations such as the United States, Britain, and Japan, but also those strategists whose countries have maritime ambitions, such as China and India. Fernando de Oliveira (or Fernão de Oliveira) was an interesting man living in interesting times. A true polymath educated in a Catholic seminary, it soon became evident that God had other plans for him. 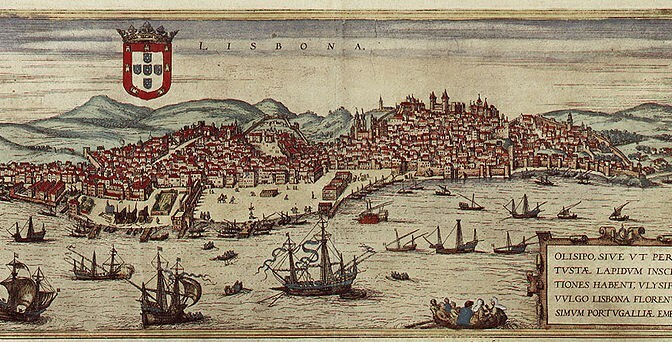 Oliveira dwelled in the maritime community of Lisbon, then as now a capital with an umbilical connection to the sea, learning key skills that made him a valuable asset for any navy. These skills included: navigation (he became a pilot aboard a French warship in expeditions against British commerce); shipbuilding (two English kings coveted his counsel whilst a prisoner of war in London); negotiation (he led a prisoner exchange when a Portuguese military expedition to north Africa failed; and possibly espionage (some sources mention his spying for the Portuguese Crown in negotiations with the Vatican). In between his adventures, Oliveira wrote invaluable works that rival “The Art of War at Sea” in scope and insight. These include the world’s first encyclopaedic treatise on navigation and shipbuilding entitled Ars Nautica (ca. 1570), which he later expanded into the first treatise on naval architecture, Livro da Fabrica das Naos (ca. 1580), the first book on Portuguese grammar, Grammatica da Lingoagem Portuguesa (1536), and one of the first books on Portuguese history, Historea de Portugal (ca. 1581). These works attest to Oliveira’s genius. Unlike Corbett, who entertained a career as a novelist at first, Oliveira made a lasting literary contribution to fields beyond maritime strategy. There is every reason for Fernando de Oliveira’s “The Art of War at Sea” to become compulsory reading for sailors, mariners, strategists, historians, and laymen with an interest in the complexity of conflict at sea. I will highlight only four of them. First, the book is a distant yet direct ancestor to the current mainstream canon of maritime strategy. Incorporating this source into the canon and submitting it to academic scrutiny will help illuminate the origins of Western maritime strategic thought. Second, there is an inherent value in studying Oliveira’s work in the context of naval warfare in the age of sail, particularly Portugal’s path toward a global maritime empire. Third, the book retains great relevance for current debates on maritime strategy. Oliveira’s thoughts on the building, maintenance, and deployment of navies in the pursuit of policy can inform decision-makers, analysts, and the larger policy community on the often misunderstood nature and character of naval warfare. Fourth, “The Art of War at Sea” can foster a debate on broader issues of strategy and power in light of existing scholarship on just war theory, military leadership, defence economics, and so forth. In conclusion, it is high time for the naval community to retrieve Fernando de Oliveira’s “The Art of War at Sea” from the dustbin of history. My current efforts to translate the treatise to English will hopefully set this process in motion. Tiago Mauricio is a WSD-Handa non-resident fellow at Pacific Forum CSIS. He holds an MA in War Studies from King’s College London and is continuing his studies at Waseda University, after spending two years as a researcher at Kyoto University, Japan. 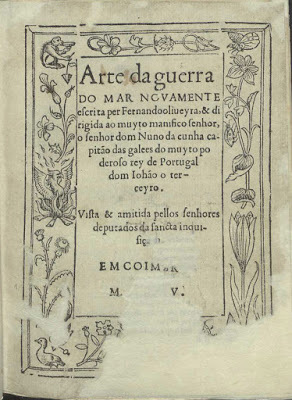 He is currently translating Fernando de Oliveira’s Arte da Guerra do Mar (1555) to English. Bravo/BZ to Tiago! this will be a wonderful contribution to the literature on sea power, and in English. I have the Vegetius book on naval affairs from his larger De Re Militari. One of my former students, a classic major, found a translation, so I will be glad to see this added to the ancient-modern cannon of sea power. BTW, Thucydides and Herodotus remain the starting point until the Asian Scholars come up with something comprehensive from the Chinese tradition (unless one wants to selectively read Ralph Sawyer’s excellent 7 Military Classics translation). Thank you very much sir. Apologies for my delay, I was out of town. There are some interesting facts and speculation about studies on sea power by Portuguese and Spanish authors. I have found one reference to a Castilian king’s “notes” on naval strategy dating to the 14th or 15th century. Unfortunately it was the only reference I found I have not been able to verify it. I will explore it during my next trip to Portugal. As for a comprehensive treatise from the Chinese tradition there is reason to be optimistic. We just have to wait and see. An English translation of Fernando de Oliveira’s work will be must welcome in order to trace the genesis of the concept of Sea Power before Mahan. Thank you sir. I will be publishing more articles in the coming weeks and months on specific elements of Oliveira’s work. It won’t replace the full translation but the review, editing and publishing process is rather lengthy. I will try to keep you updated on any progress on that front. I’m pleased to hear of your efforts to do a full translation of Fr. Fernando de Oliveira’s treatise “The Art of War at Sea”. Do you have a projected completion date for the project?